Lost Levels :: View topic - videos surface of Namco's Rave Racer for PowerVR equiped PCs Lost Levels - A website about unreleased video games. Early footage of the unreleased Rave Racer for PC using first-gen PowerVR card. 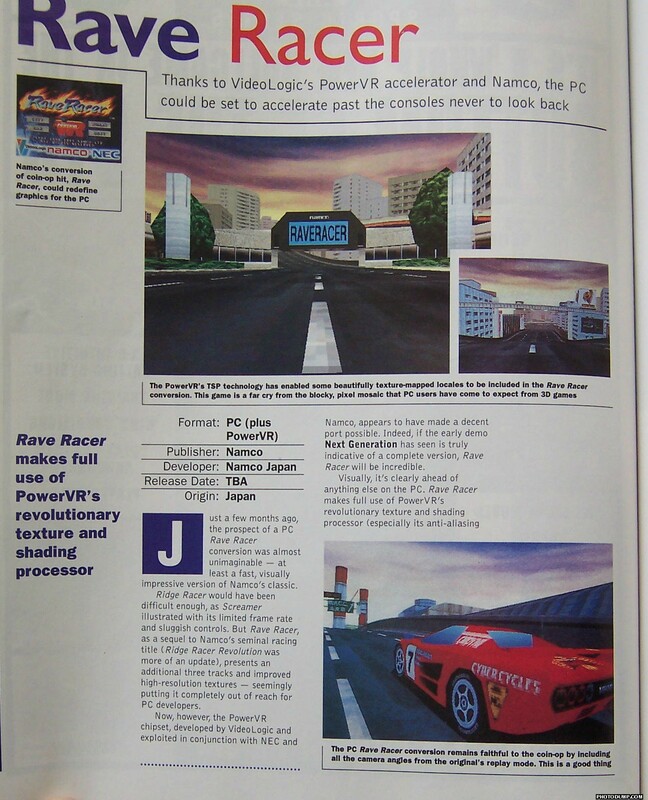 Only very recently has footage of PowerVR Rave Racer been uploaded to the net. Rave Racer, not to be confused with the completely different Rage Racer on PS1, was the third arcade game in the Ridge Racer series, released in 1995. Namco pledged support for the upcoming PowerVR PCX1 (Series 1) 3D accelerator for PCs in late 1995, in the form of porting 3 arcade games: Rave Racer, Air Combat 22 (different than Ace Combat 2 on PS1) and Tekken, which would be released sometime in 1996. A wide range of content developers and add-in board manufacturers have announced or pledged their support for the PowerVR architecture. In November 1995, Namco Ltd., the leading arcade game manufacturer, announced it will be porting games such as "Rave Racer," "Air Combat 22" and "Tekken" to PowerVR. Other companies announcing their support for PowerVR include: Activision, Looking Glass Technologies Inc., Mindscape Bordeaux, Mindscape, International, Psygnosis Ltd., Gremlin Interactive Ltd. and Virtuality KK. Additionally, VideoLogic and NEC Home Electronics have all indicated they will be announcing add-in graphics boards for PCs later this year. Of the 3 games, the only one that was ever seen was Rave Racer. It was previewed in mid 1996 by Next Generation/EDGE. The PowerVR PC version of Rave Racer would be rendered at 640x480, running at 30fps (half the framerate of the arcade) on a Pentium 133 machine, although using fewer polygons than the System 22 arcade version. However with better lighting & shading. Overall this meant, according to Videologic, PowerVR Rave Racer would be doing 4 times the graphics work of the PS1 version of Ridge Racer. 1996 came and went, Namco and Videologic eventually went silent, no release date was ever given. As 1997 rolled on, it became apparent that Rave Racer (along with Air Combat 22 and Tekken) would never happen for PowerVR PCs. No cancelation, not a peep. It's as if the PowerVR versions were just swept under the rug. Thankfully, in 2002, the System 22 arcade hardware was emulated decently (VivaNonno emu) making it possible to play RR1, RR2 and Rave Racer at 60fps, although a 128 MB videocard was required to get full texture resolution. Note that the Dreamcast used a customized version of PowerVR Series 2. Wow, am really surprised no one commented after some long-lost footage was discovered. Pretty cool, especially since Rave Racer never saw a home release here! I'm definitely a fan of the Ridge Racer games (I have all of them except Rave Racer, PSP, RR7, and Unbounded)- just not a big PC gamer. Rave Racer as it was in arcades (not counting the tracks on PSP or arcade emulation) never saw an official home release anywhere in the world, on any platform. Namco released Ridge Racer 2 (1994) in the arcade, which was a major update of Ridge Racer (1993), containing a brand new soundtrack and a rear vision mirror. The soundtrack remains incidentally my most favorite of the series (GRIP anyone?). They also released the PlayStation-exclusive Ridge Racer Revolution (1996) which was a brand new (and in my opinion amazing) game, containing the soundtrack of the arcade-only Ridge Racer 2. Rage Racer (1997) was another brand-new PlayStation-only title, which was lesser "arcade" and more "career"-focused than the previous entries. 90's Gamer: You are absolutely right. I would just add, the Japanese PS1 release of Ridge Racer Revolution was December 3, 1995. This released happened only a matter of months after arcade Rave Racer released everywhere. Ridge Racer Revolution's western release was indeed in 1996. Rage Racer was released in Japan December 3, 1996, one year after RRR. A PlayStation conversion of Rave Racer was never even rumored, IIRC. No doubt it was hoped for, but not actually rumored to being in development on Sony's platform. 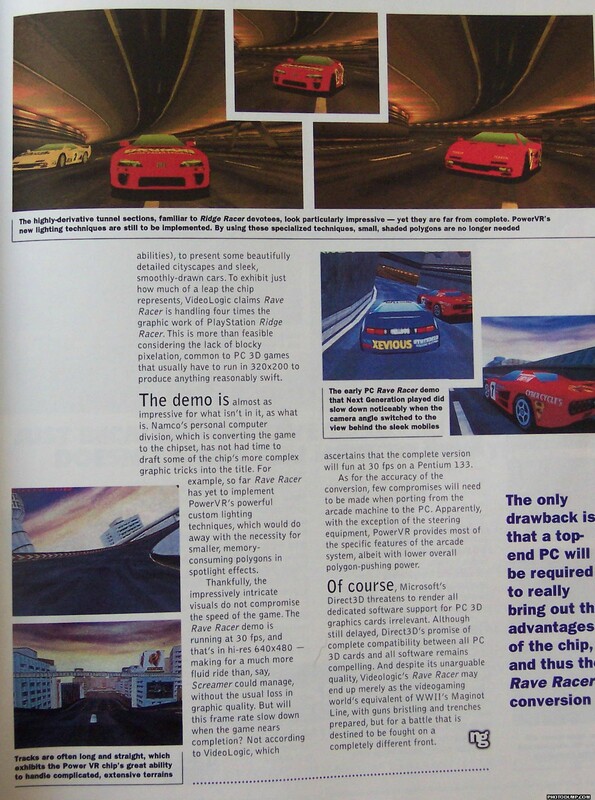 Rave Racer was however rumored to be in the works for Nintendo 64 (EGM magazine and I think some online reports). Although even assuming this was true, N64 wouldn't have been able to match the quality of the canceled PowerVR PC version with its 640x480 res, polygon detail (which was high but still reduced from the arcade) textures & shading / lighting at 30fps (half the arcade's framerate). It was reasonable speculation at the time that Namco probably canned the unannounced & unseen N64 Rave Racer after the Nintendo 64 system bombed in Japan because of PlayStation's success and to a lesser extent, the Sega Saturn, which also outsold N64 in that territory. N64 would get another different game, Ridge Racer 64 at a later point in time (in 2000) developed by Namco and Nintendo Software Technology. Now, if Rave Racer had been made for PlayStation, I think late 1996 would've probably been the time to release a conversion in Japan. However Namco made Rage Racer instead. The western release of Rage Racer was indeed 1997. Nobuyoshi Sano is a freaking hero of mine.